* $25 VIP ticket includes 1 ticket for concert VIP seating and reception admission for 1 adult and your festival student(s) immediately following concert to meet the Harlem Quartet and Festival faculty. Since its public debut at Carnegie Hall in 2006, the Harlem Quartet has thrilled audiences in 47 states as well as in the U.K., France, Belgium, Brazil, Panama, Canada, Venezuela and South Africa. 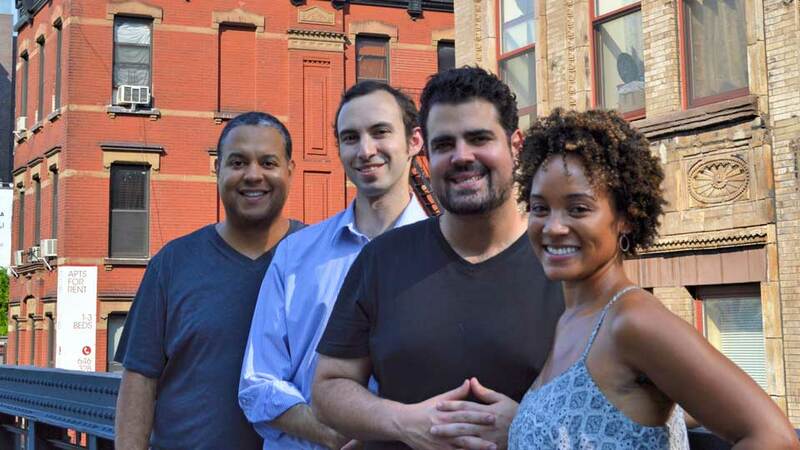 Harlem Quartet’s mission is to advance diversity in classical music, engaging young and new audiences through the discovery and presentation of varied repertoire that includes works by minority composers. This quality makes them a perfect fit for the residency created in partnership between the Carlsen Center at Johnson County Community College and the Heartland Chamber Music Festival, which takes place on the JCCC campus for nine days each summer. Passion for work with young people has made the quartet a leading ensemble in both educational and community engagement performances. In this capacity, the quartet has written several successful grants, including a Cultural Connections Artist-In-Residence grant from James Madison University and a 2016 Guarneri String Quartet grant from Chamber Music America; the latter allowed the quartet to participate in an extended performance and educational residency in Mobile, Alabama, that included a close partnership with the Mobile Symphony Orchestra. Each member of the quartet is a seasoned solo artist, having appeared with such orchestras as the Boston Pops and the Atlanta, Baltimore, Cleveland, Detroit, National, New World and Pittsburgh symphony orchestras. Alongside its regular activities as a chamber ensemble, Harlem Quartet performs a variety of works written for solo string quartet and orchestra. In June 2012, with the Chicago Sinfonietta under Music Director Mei-Ann Chen, the quartet gave the world premiere of Leonard Bernstein’s West Side Story as arranged for string quartet and orchestra by Randall Craig Fleischer. It reprised its performance of that score in September 2012 with the Anchorage Symphony Orchestra under Fleischer’s direction, and again in December 2012 with the Santa Fe Concert Association. Chicago Sinfonietta and the quartet recorded the West Side Story arrangement, along with works for string quartet and orchestra by Michael Abels and Benjamin Lees, for the Cedille Records release Delights and Dances.